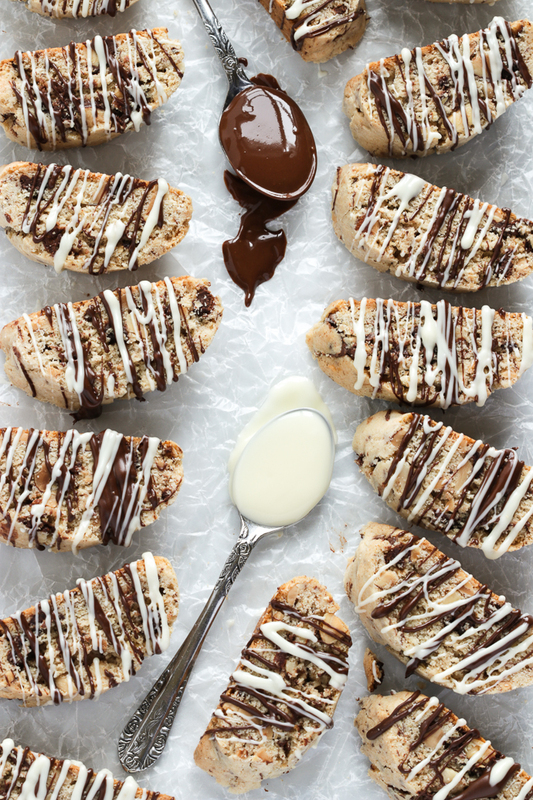 Tender, elegant and sophisticated Chocolate Pine Nut Biscotti, studded with semi-sweet chocolate chunks and pine nuts and a generous sprinkle of turbinado sugar for some extra love. 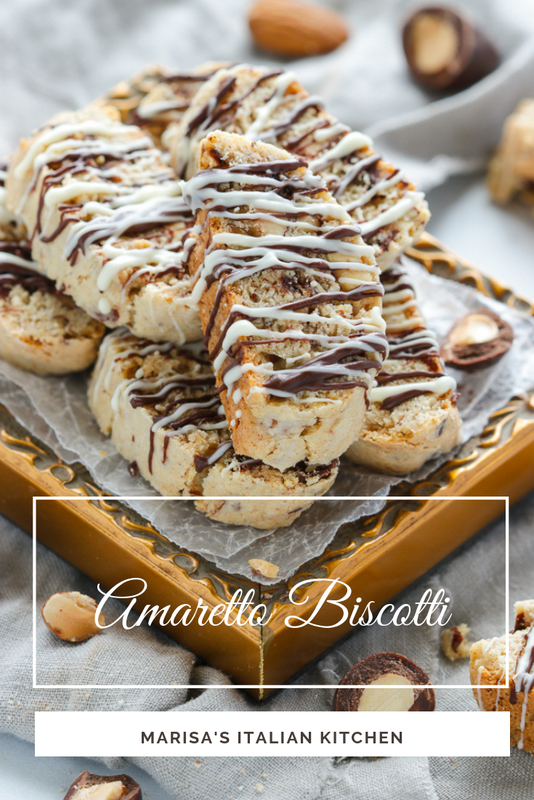 If you have been following along for a while then you probably know by now how much I adore biscotti! 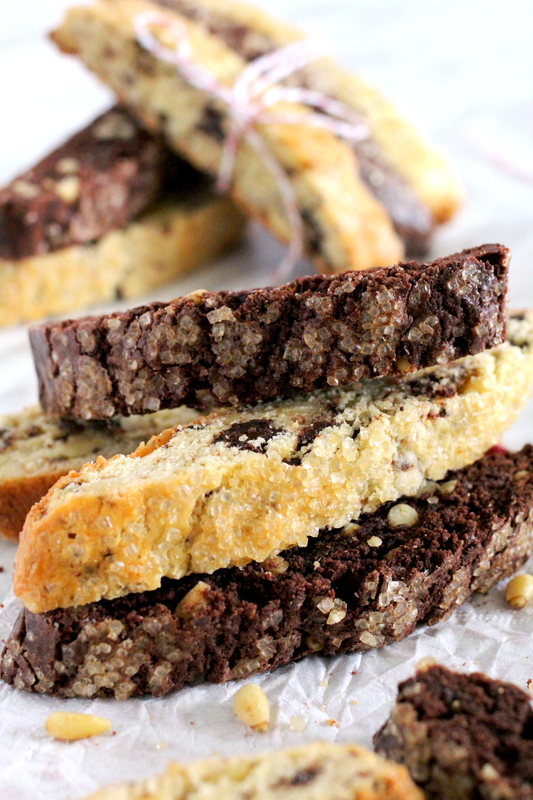 There simply is no holiday or special occasion without at least one form or flavor of biscotti. 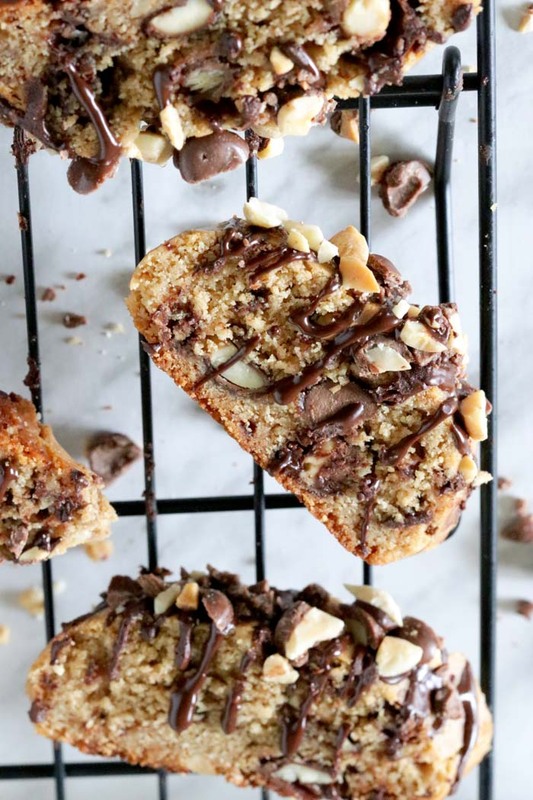 These Chocolate Pine Nut Biscotti are adapted from Anna Olsen’s cookbook “Another Cup Of Sugar” and have graced my holiday cookie platter for many years now and are everything I adore in a good biscotti! 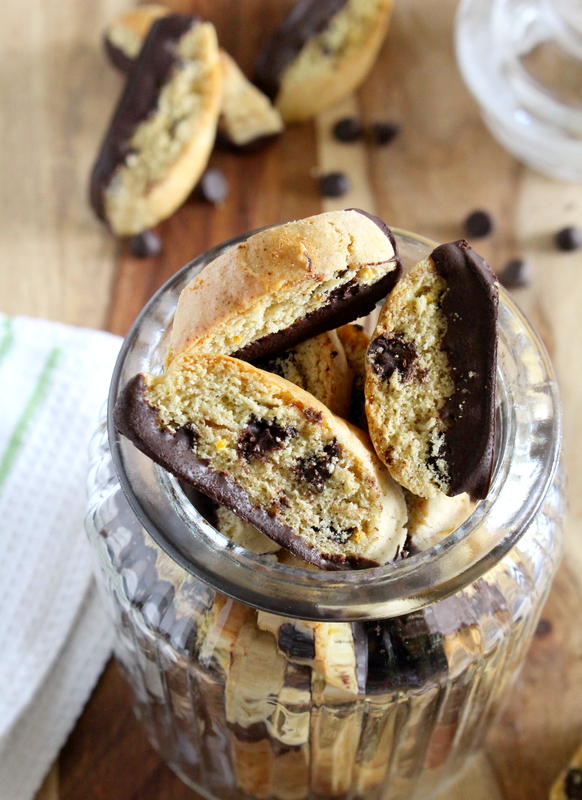 In my opinion they are the absolute “ultimate biscotti”. 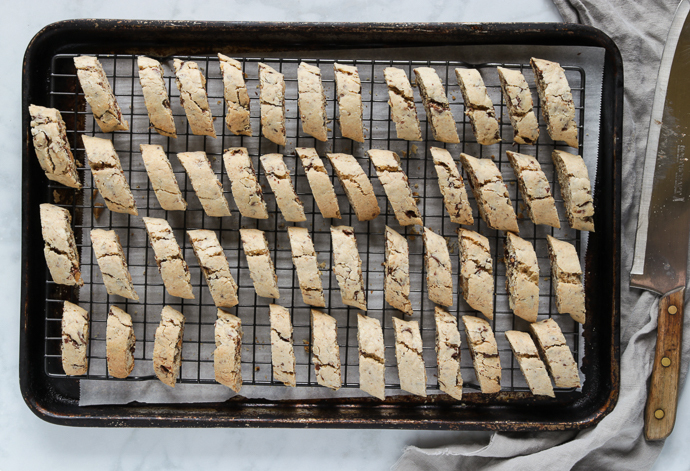 These biscotti are a far cry from the rock hard variety sold at most coffee shops as those are usually made without butter and are more suited for dunking in order to render edible. What also sets them apart from the other varieties is that after the initial first bake of 30 minutes they are slightly cooled, sliced and returned to the oven with the oven turned off and allowed to dry out this way for an additional 30 minutes. So in fact they really only get one bake. 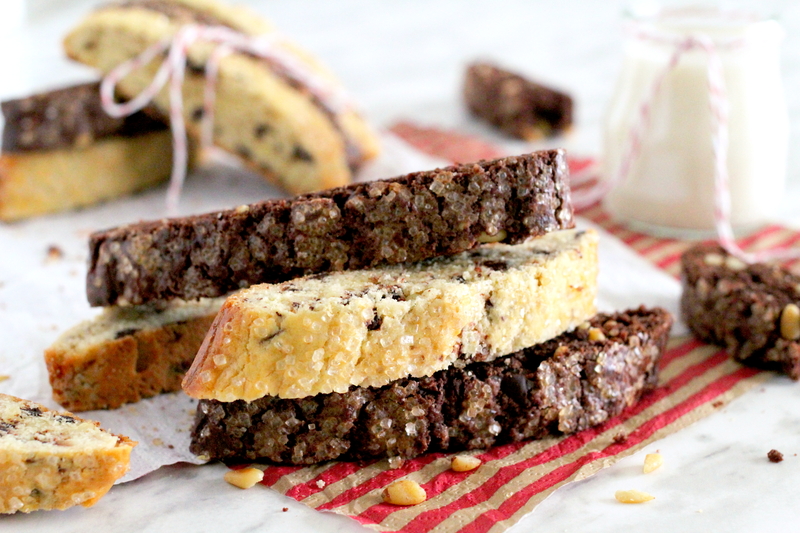 Most noteworthy here is that the cornmeal plays a large part in keeping the biscotti ever so tender. 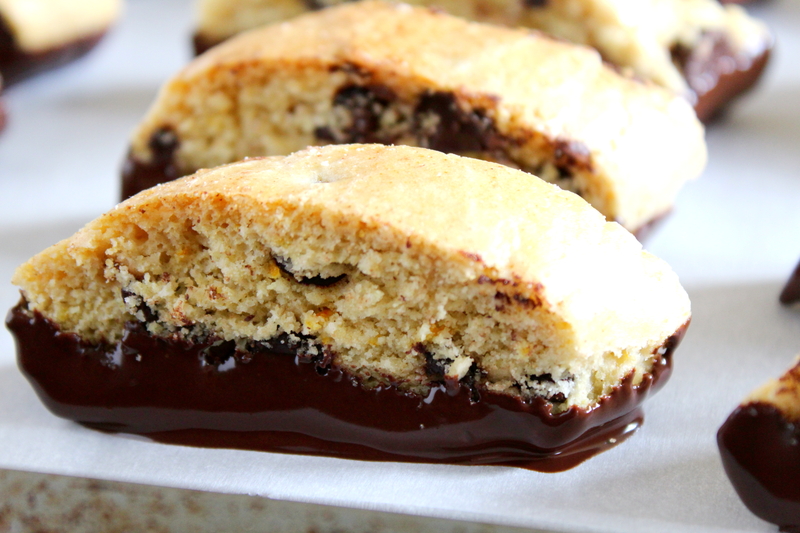 Deliciously speckled with tender roasted pine nuts and chocolate chunks with a slight crunch from the cornmeal. A generous sprinkle of sugar crystals for a festive appeal and a lovely almond flavor coming through in every tender bite! 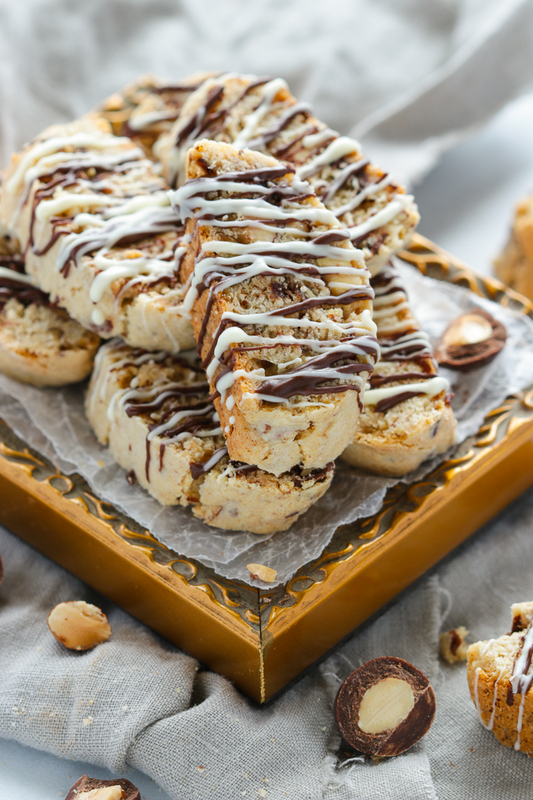 I love baking both variations and serving them together for a stunning display of biscotti bliss as they are truly a wonderful finale after a special meal. Follow recipe as indicated except omit the 3/4 cup plus 2 tablespoons of cocoa powder and replace it with all purpose flour. The total amount of all purpose flour will then be 3 1/3 cups of flour for the pine nut biscotti. 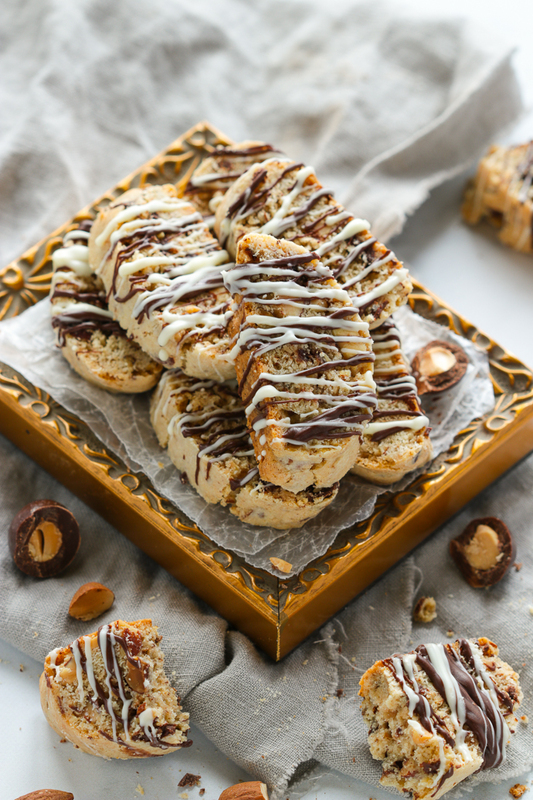 These rich and decadent Chocolate Pine Nut Biscotti have a tender texture and are the perfect finish to any elegant meal. In a large bowl cream together the butter with both sugars for a couple of minutes or until light and fluffy. Add in the eggs one at a time, until each is fully incorporated. In a medium sized bowl, sift together the flour, cocoa powder, durum semolina and the salt. Add the flour mixture to the butter mixture and stir just until blended. You will have a soft dough. 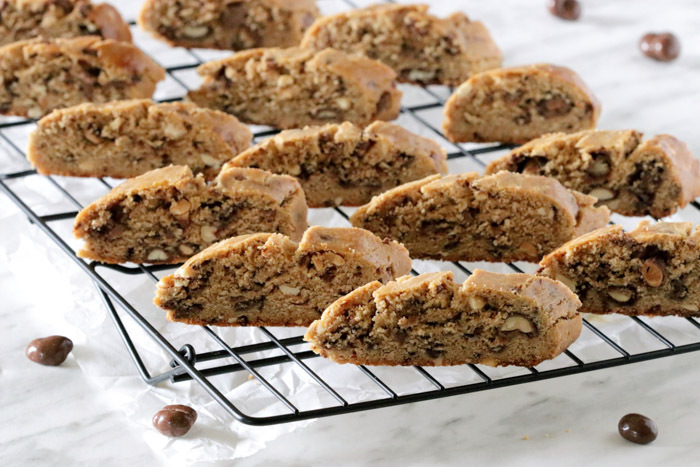 Stir in the pine nuts along with the chocolate chunks until evenly distributed. Transfer the dough onto a floured work space and divide in two. The dough will spread during baking so make sure they are 2 inches apart. 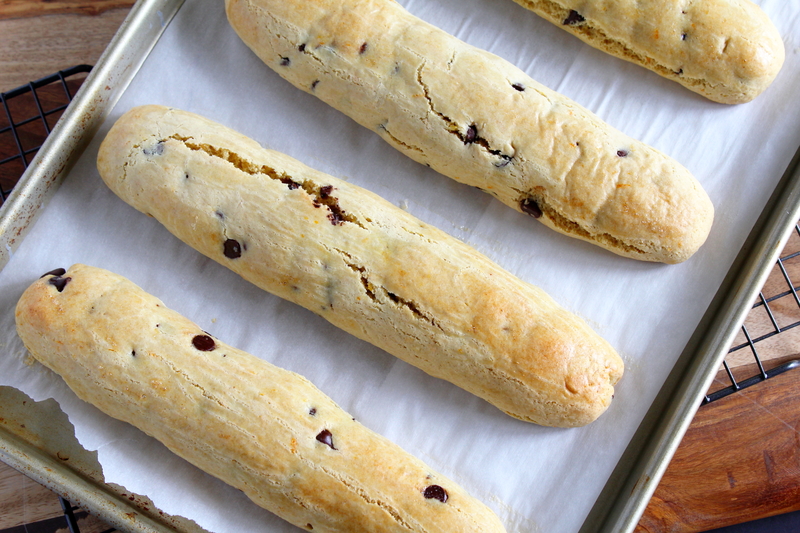 Using a pastry brush, lightly brush the biscotti logs with the egg wash.
Sprinkle generously with the turbinado sugar. Bake for 30 minutes and when ready the tops should feel firm to the touch. 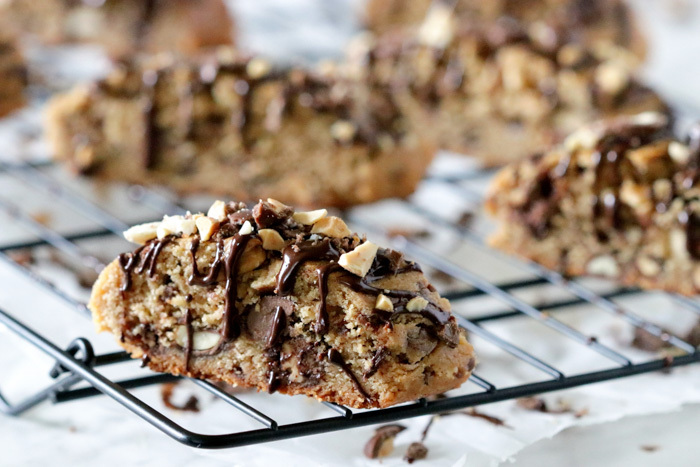 Remove the biscotti from the oven and allow them to cool on the cookie sheet for about 15 to 20 minutes, because this will make them easier to slice. Transfer the logs to a cutting board and slice each log, one at a time, into 1/2 inch slices. 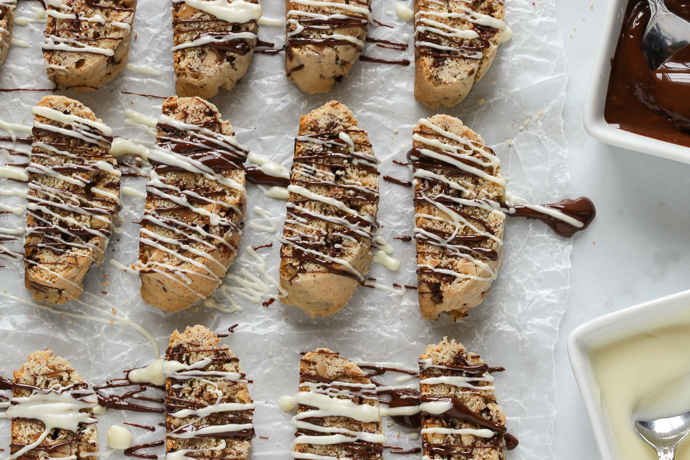 Place the sliced biscotti upright on the baking sheet. 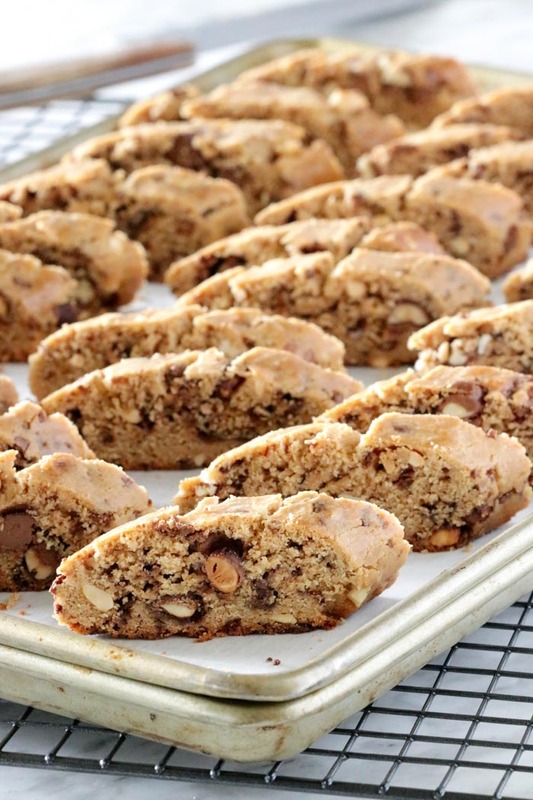 Return the cookie sheet to the oven and turn the oven off. 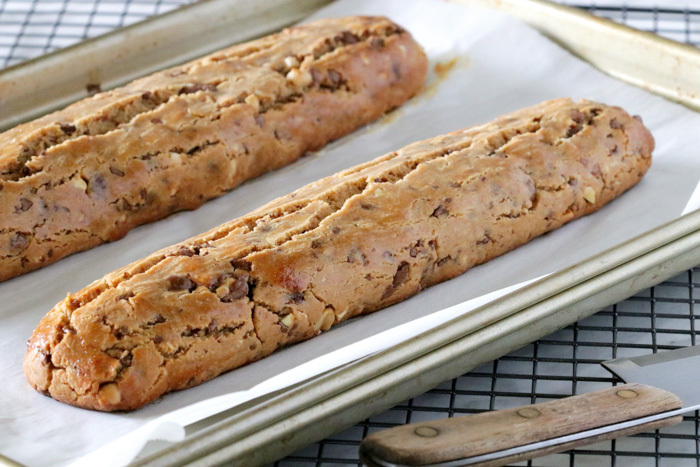 Keep in the oven for 30 minutes so that the biscotti slowly dry out as the oven cools off.